This is a thoughtful and helpful summary of key issues Tim. Will have to go away and reflect on this. I’m not quite sure what you mean by ‘discipline building’ — would you be able to elaborate? I can understand what you mean about the lack of time for discussions, although personally I didn’t feel that discussions were stifled (I guess I’m more used to this style of conference!). Certainly the room was an odd shape… I don’t know if you attended any of the workshops but some of those had *crazy* rooms. I like your ideas about platforms for pre-conference collaboration. Indeed, this was preciesly the goal of Web Art and Science Camp, an event I co-organised years ago, was aimed at engaging with and broadening the WebSci and Hypertext communities. I don’t want to lead you astray from your PhD, but perhaps you could chat to your supervisor about the possibility of a future similar event, or — to be way more lightweight — a WAIS-based thing maybe half a year before the WebSci’14 deadline to throw ideas around. It could go in the regular seminar slot. What’s the Open Spaces method? Is it related to unconference formats, or birds of a feather sessions? You’ve clearly thought deeply about all of this. Thanks for the post! Thanks Clare for the detailed comments. – Building a discipline might be thought of as creating a body of knowledge and methods, and a collection of journals, conferences and other fora, such that the value of activity can, to a greater or lesser extent, be measured in relation to these reference points, and promotions, careers and discussions are structured around these. Disciplines generally seek to reproduce themselves, training people in that same set of tools and skills, and working on problems primarily under that disciplinary identity. This can help secure funding, scale-up training around needed skill sets, and increase the security of careers for those who choose to be ‘web scientists’ (i.e. avoiding people needing to split their identity – publishing in web science journals on the work they’re interested in, but having to publish back into ‘home disciplines’ to get the academic credit needed for promotion etc.). 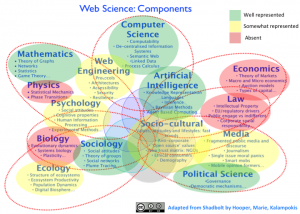 I’m personally relatively ambivalent about discipline building: asides from nothing that it can risk creating distractions from problem-centred research, and that in web science any fixing of boundaries for web science as a discipline would necessarily involve a degree of exclusion of some of those currently within the broader ‘field’ of web science. – By ‘field’ I understand an interdisciplinary space, where people are not only addressing particular problems, but are also contributing to a shared interdisciplinary knowledge base consisting in overlapping collections of knowledge and theory. 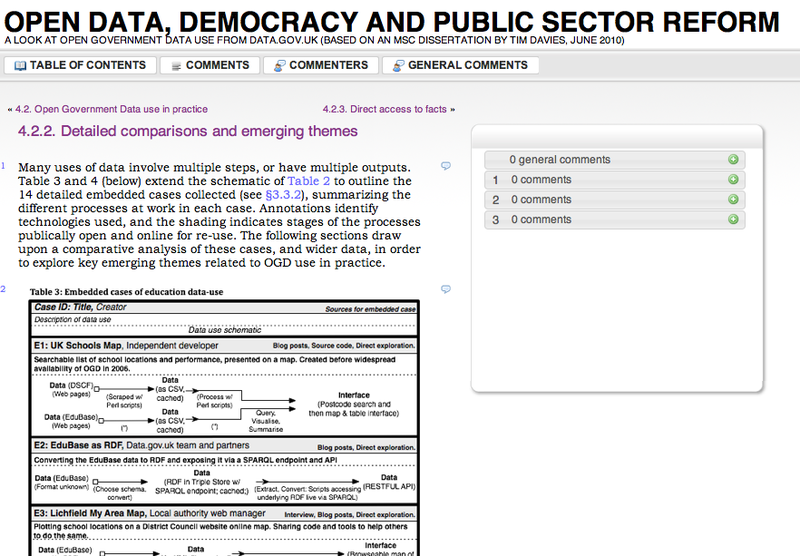 – There is more on ‘Open Space’ conference formats here. It is an unConference approach. – I’m already fairly astray from my PhD but already talking with other students and staff on possible approaches to support more cross-boundary collaboration ahead of WebSci 2014. In the post I was particularly thinking about digital platforms for pre-conference collaboration – such as, for example, opening up the agenda drafting process (which could be as simple as sharing a google doc through which the agenda is being put together for a 5 day period of comments from the authors and delegates to help put together the best possible sets of papers). – Whether multi-tracks lead to the conference splitting I think depends on facilitation, chairing and curation: not on the existence of multiple tracks or not. If the ‘community’ has to be ‘forced’ to share as space in order to exist as a community, then we’ve got problems.